1-Gather all the ingredients (vary colors). 2-Prepare the dough by sewing the bottom circle to the border. 3-Leave to rest and start with the decoration of the cake. 4-Arrange thin slices of dough on the 2nd circle and sew them. 6-Go back to your dough, add the cream (the filling ^^) as you sew close thi good cake. 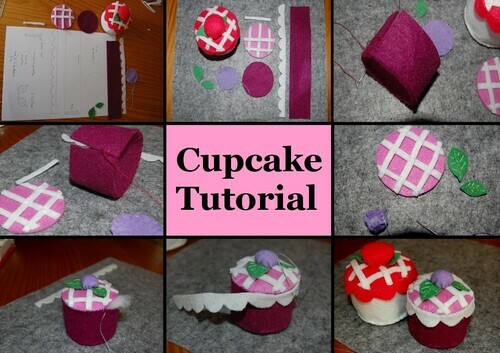 7-Use the piping bag on the outline of the cupcake to add a creamy touch. 8-Good tasting, waiting for your opinions on my recipe. So cute! Tks for the tute!